Adding a euro quotation for investors. 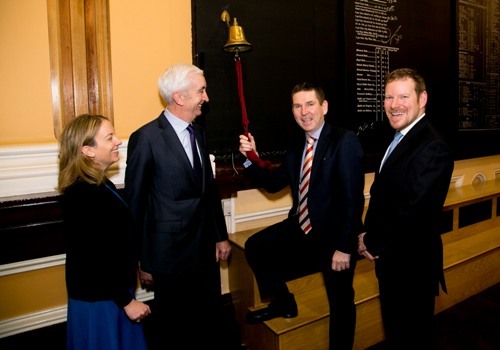 (L-R) Padraic O'Connor Chairman ISE Tony Richardson CEO Venn Life Sciences Jonathan Hartshorn CFO Venn and Orla O'Gorman Head of Equities ISE Venn Life Sciences, the growing Contract Research Organisation (CRO) has joined the Irish Stock Exchange’s (ISE) Enterprise Securities Market (ESM). Venn Life Sciences is utilising the ESM’s dual listing regime with the London Stock Exchange’s AIM to enable Irish and international investors access their shares through a euro denominated quotation. Venn Life Sciences, which has a market capitalisation of €19m, provides drug development, clinical trial management and resourcing solutions to pharmaceutical, biotechnology and medical device organisations. With operations in France, Germany, the Netherlands, UK and Ireland, Venn Life Sciences also has resources across the globe working on clinical studies for the company. 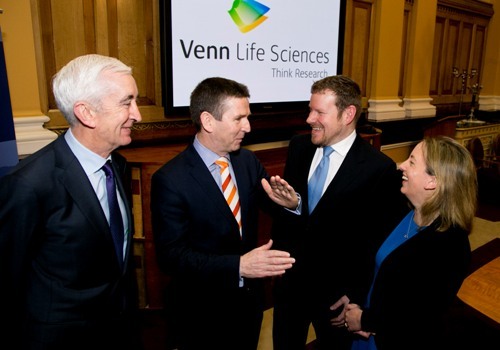 Venn Life Sciences joins other ISE listings operating in the pharmaceutical and biotechnology sectors – Malin Corporation, Mainstay Medical and Merrion Pharmaceuticals.